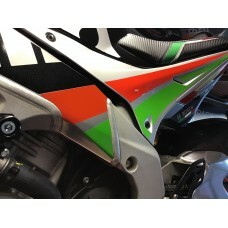 Frame decals for the 2017 Aprilia RSV4 and Tuono V4. Wet application - all colours are supplied individually with traditional application paper tape for fitting as individual colours with the aid of an application fluid or water/soap mix. Dry application - supplied as a pre built decal with our standard clear application tape. Although it is possible to apply this option wet the modern style tape can produce mixed results and requires patience. These decals are cut from a single colours of high quality vinyl in the colours shown ( Red / Silver / Green ) although we can reproduce alternative colours on request. Please note : This is the FRAME decal only.